I'll save the discussion of "The Love Boat" for another day, but "Fantasy Island" really hasn't been on television for a few years (it seems that TV Land doesn't routinely recycle old network shows as it once did, and even newcomers like Retro Television/RTV, Antenna TV, and Me-TV which have pretty much taken over as far as showing old re-runs, but each has limited their content to a few programs each. Right now, neither "The Love Boat" nor "Fantasy Island" appear on any of their current line-ups, although that could change down the road. The original idea for "Fantasy Island" was not creative genius, but a willingness to do whatever it took to make a few (million) bucks. Aaron Spelling was in a pitch meeting with the network and his big ideas were not going well. That lead to an exasperated joke from the producer. "Aaron was in his office, trying to sell a show to ABC," his wife Candy recalled in an oral history for The Hollywood Reporter, "and I heard him say, 'What would you like me to do? Put some guy on an island and have him grant wishes to people?' He was being sarcastic." He was kidding. But, of course, the network loved the idea, hence "Fantasy Island" was born. Given the lack of creative inspiration for the successful series, we would later learn that the lead actor himself was largely responsible for his portrayal of Mr. Roarke. Actor Ricardo Montalbán, who ultimately played Mr. Roarke on "Fantasy Island", decided on his own what the backstory of what Fantasy Island really was. In his mind, he said he guided his performance with the idea that Mr. Roarke was not God, or necessarily some kind of angel, but was he was also not the devil, rather he was kind of the man who ran purgatory. "He's not the devil ... what is he? What is he?" Montalbán mused about his character in an interview late in his life. "Even though the audience didn't realize what I was thinking... I decided this man was an angel who still had a little sin of pride in him... so he is in charge of purgatory, and he has his little cherub to help him." (see the Archive or American Television coverage HERE). Curiously, Mr. Montalbán was not the actor the network wanted as the lead actor for "Fantasy Island". ABC pushed hard to have the venerable, but faded star Orson Welles as the show's headliner. Despite the network's desire for Orson Welles, Mr. Spelling wanted the Montalbán and won, obviously. In hindsight, it seems Mr. Spelling's selection helped to make the series work. Apparently, the team from Shout! Factory, which began as a company when some guys from the former retro record label known as Rhino Records (after Rhino was sold to Warner Brothers) decided to continue what they were doing ... on their own. 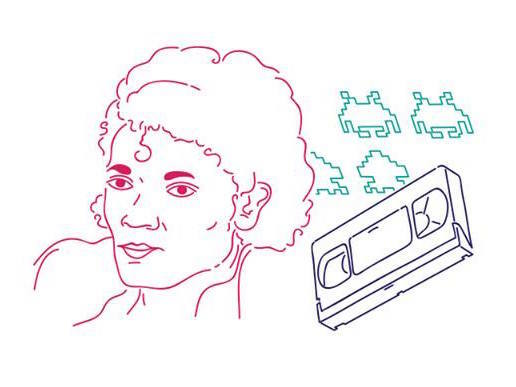 But beyond just music, the company also saw opportunity in home video as well. Since then, Shout! Factory has released a bunch of retro TV programming to DVD, including at least one that few entertainment executives expected to sell well: the PBS educational series "The Electric Company". In fact, that particular show sold so well, that the company released both Season 1 and Season 2. But that's irrelevant to today's post, except that it demonstrates that Shout! Factory can see opportunity to make money on the major media companies' discards. The company has picked up the rights to a few other '70s-'80s shows whose early seasons were released, but stopped, including the "Diff'rent Strokes" spinoff known as "The Facts of Life" and "Night Court", and both have apparently sold well enough among collectors of retro TV. Shout! Factory evidently saw how well CBS Home Video's (Viacom's) "The Love Boat" sold, and concluded two things: first, that there was a market for Season 2 of "Fantasy Island" and second, they didn't want to get too greedy like CBS did by splitting a full season of old TV programming into separate volumes. I suspect that Shout! Factory also has a good grip of how much volume they need to sell to make a profit, so they usually don't overpay for content rights to shows like "Fantasy Island" and they may even be doing small volume productions so they don't get stuck with excess unsold inventory like the major providers (Sony, etc.) do. 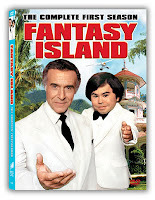 The good news: "Fantasy Island" Season 2 was released on DVD on May 8, 2012. I had Season 1 from Sony already, and while I was generally pleased with it, the show really didn't become the magnet for actors and actresses looking for work until subsequent seasons, so the guest roster in Season 1 was OK, but Season 2 is definitely better. Sure, I knew who Mabel King was (in addition to being an accomplished stage actress, she also played the role of the mother on "What's Happening" back in the '70s), and there are a few other big names like Maureen McCormick (Marcia Brady), Bernie Kopell (best known as Doctor Adam Bricker on "The Love Boat", but also known for his earlier role as Siegfried on "Get Smart"), Don Knotts (from "The Andy Griffith Show", and later "Three's Company"), Leslie Nielsen, Lucie Arnaz (not that she ever really acted, her brother was on "I Love Lucy", not her), and Jim Backus and Alan Hale (both from "Gilligan's Island"). But Season 2 is full of many more stars, and probably the ones Generation X are more likely to recognize. A few more from "The Brady Bunch" show up in Season 2 including Florence Henderson, Robert Reed, as well as a surprisingly young Regis Philbin, celebrity psychic and fortune-teller Jean Dixon, Eva Gabor and plenty of others. In all, I think Shout! Factory has done a great job with Season 2. The original production content was reportedly not in the best shape so given what they had to work with, the content looks decent and now, you can watch it commercial free. There's more good news! Season 3 is coming to DVD on October 23, 2012. Amazon is taking pre-orders HERE. Fantasy Island originally began as two made-for-TV specials which aired in 1977. Viewer response was positive, which persuaded ABC to green-light a weekly series. 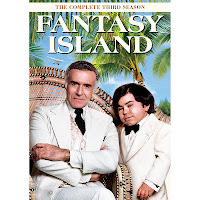 For those of you not familiar with it, the basic premise of the show is as follows: a mysterious island exists and people can pay to have their fantasies fulfilled while visiting this island (hence the name "Fantasy Island"). Inevitably, the desires of the island's guests aren't all they're cracked up to be, adding to the mystery and providing a lesson to be learned for each visitor who can pay the price to have their fantasies fulfulled. The regular cast consisted pretty much of two people: Ricardo Montalbán who plays Mr. Rourke, the island's host, and his personal island assistant known as Tattoo, played by the French little-person Hervé Villechaize who also starred as an enemy on the 1974 James Bond flick "The Man with the Golden Gun". Retroland did a review of "Fantasy Island" HERE. Incidentally, hor those curious about the footage in the show's opening and where on earth that can be found, that island is the island of Kauai, which is part of the archipelago that makes up the U.S. State of Hawaii. At least, that's where you can find the gorgeous waterfalls seen in the opening credits, Wailua Falls.